Echoes of a forgotten past in a changing land. 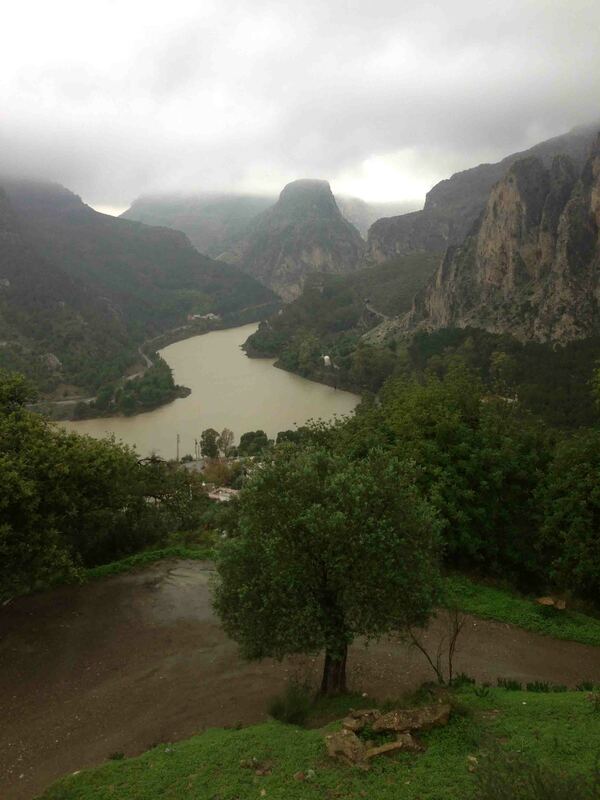 El Chorro ( For the second time this year ), November 2012. It will be 12 years or so I have been going to El Chorro, every time I go I always see the Goat man. The Goat man I generally pass by as I drive in and out of the village onto either my way to the Supermarket in Alora or the airport in Malaga. The Goat man is just that, he has a pack of rangy dogs at his heels and a herd of perhaps a 100 goats which range through the olive groves on the hillside under the crags. I have never really thought about him before, too intent on my business at hand. Sitting outside out rented cottage in the afternoon sun I could hear the bong, bong, bong of the bells around the necks of his beasts coming drifting from the fields on the warm and sultry breeze. It struck me then that this was a sound as old as the humanity in this area, it was probably there when the landscape was very different but in essence really the same. It would have the same shape, the vultures would be circling on the thermals over the Sierra and the Olive trees, in their haphazard planting, would still be harvested every year at the same time. We had retreated to our old Spanish climbing haunt as the weather deteriorated in the UK making climbing for an extended period unlikely. We were not disappointed, only one day was spent brooding due to precipitation. There had however been a lot of rain the week before we arrived, roads were washed away, bridges destroyed and more than a few people killed in the ensuing floods. The river beds in the mountains reminded me more of Pakistan than Spain with large areas on either side of the main flow covered in boulders and mud washed down from the hills. The cave at Poema Rocka was unclimbable due to rivulets of water cascading down from little fissures in the rock, I felt distinctly uncomfortable standing under tons and tons of overhanging rocks being undermined by the continual streams of water. So we fled to more stable areas. Desplomandia, the Arab Steps, Turon up and down the Frontales crags we roamed on our 11 days of sport. On one day we went out to the valley de Abdalajais as it was a tad Scottish on the main crags. I had avoided this area before as it was perceived to be a bit of a lower grade venue with short single pitch routes. How wrong I was, yes it is slabby but still, at 70 degrees or so, reasonably steep. The beauty of it is the style of climbing, big wide cracks split the rocks giving excellent jamming and bridging routes. The grades also are a wee bitty on the soft side. There were 40m 6A’s that were more like E2’s and 5+’s like E1’s. However after getting spanked on Arabesque, a 7a I have had my eye on for ages, getting success on a fantastic 6C+ at sector Momia and ticking in excess of 40 routes in ten days it was time to come home. Chorro however is changing from the days when we first went there, it is becoming more like the Costa Blanca with large groups hogging the routes on the easier sectors displaying the usual towel on the sunbed mentality. 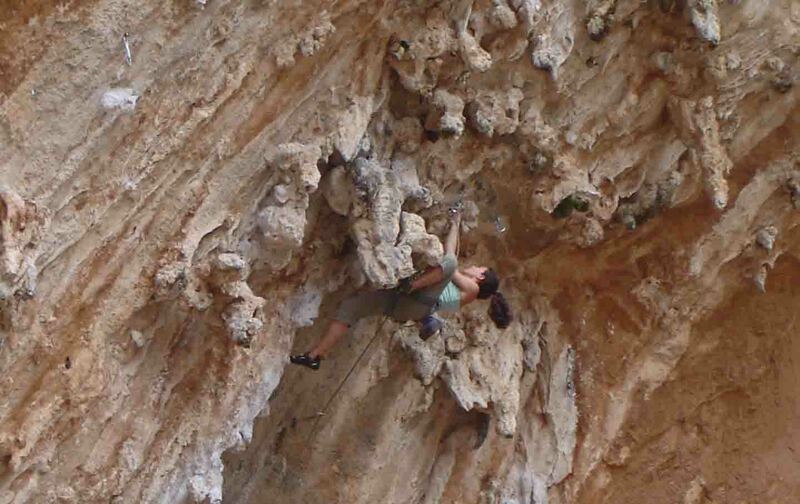 There are more places for climbers to stay and the commercial machine of climbing is gathering pace, there is even talk of the Camino del Rey being revamped as a tourist attraction. I do not think I will go back for a while. The Goat man however sees it all and it doesn’t change his life one iota. His goats still sound the chimes of a forgotten time, his dogs range feral at night and howl at the moon and he gave me a wee wave as we drove past him on our way to the airport. I wonder what he thinks of us ? Friends were people that you went climbing with and were not objects that you mortgaged yourself to hang from your harness when I started climbing. Winter training was an occasional bout of press-ups and pulls ups interspersed with sessions in the pub creating a tick list for the coming season (if you were lucky enough to get one). Anything above the grade of VS was spoken about in quiet whispers to your mates in case anyone more experienced than you overheard and gave you a (verbal) cuff in the ear for being above your station in life. Climbing (especially in Scotland) in general was the reserve of unshaven or bearded tough guys who played hard and did not take many prisoners amongst the youngsters aspiring to be one of the “recognized”. 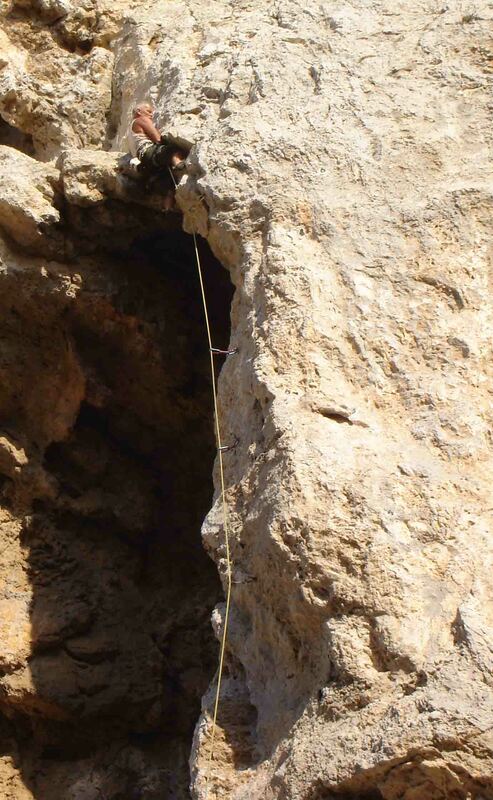 Neanderthal at Symplegades, not the climber I hasten to add. Recognized climbers had their pictures in magazines wearing outrageous lycra leggings and sometimes they would be seen at the crag with a girl, yes a girl who was prepared to face the walk in and the cold and the rain and the discomfort just to bask in the reflected glory of being his belayer (or maybe it was just the reflection of those ridiculously coloured leggings). Sitting on the ferry between Kalymnos and Telendos on our way to Irox crag I reflected on this as I counted ten lean, tanned and well-honed girls to the four guys who were accompanying them. Climbing in the last twenty years has undergone a paradigm shift in the gender balance of its patronage. 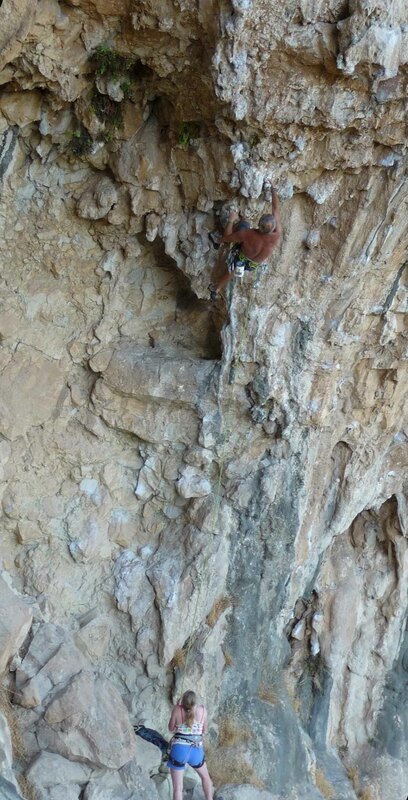 I would estimate that 70% of all the climbing pairs were couples, of the rest it was probably an even split between all male and all female pairs. 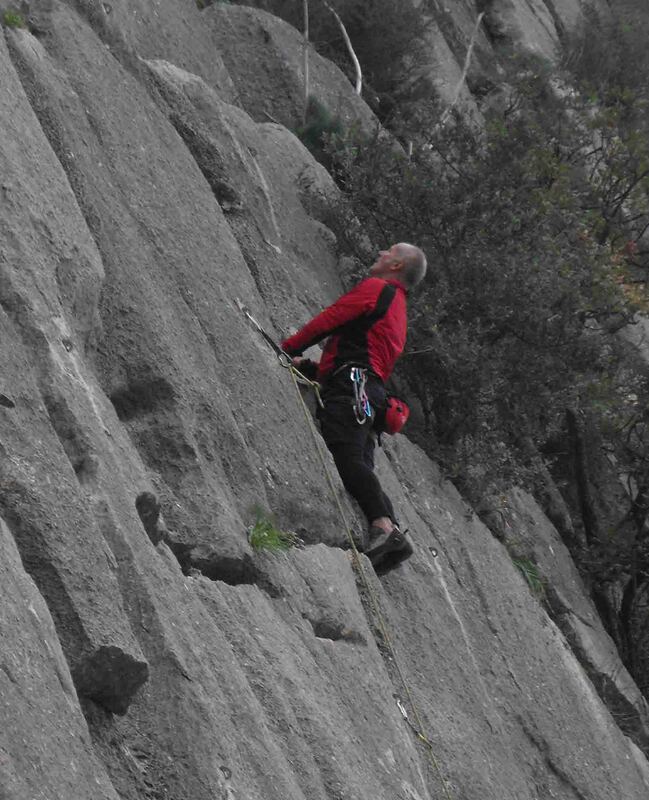 Its been a great transition for the sport, why it has happened so quickly and so effectively is of course a matter of debate but it has turned climbing into a much more popular pastime that can be shared as almost a family experience. 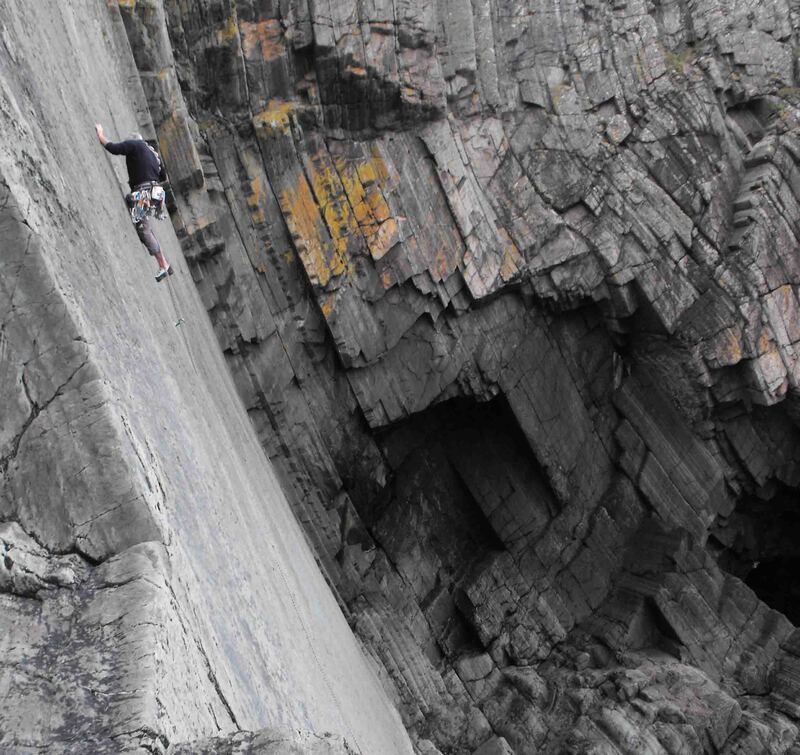 This in turn of course has created an industry and there is probably no better sport-climbing venue on the face of the planet to see this than in Kalymnos. Kalymnos, 12 years or so ago, was heading down the road of becoming just another Greek backwater as the tide of European holidaymakers dumped their usual sun and sea destinations in favour of more distant and exotic locations in which to spend their increasingly greater disposable incomes. About that time someone noticed that the island was generously endowed with limestone cliffs in all degrees of steepness, had an idea to create an industry, got the islanders on their side, hired a few world class climbers to come along and put up a few routes and the rest is history. Just before we arrived on the island it was host to the North Face climbing festival, all the pubs, restaurants etc etc were festooned with marketing material welcoming climbers. All of the crags are signposted from the roadside, most of the bars give you route updates or free topos and if you make a mistake and take the wrong path someone will usually give you a shout and put you right in your approach. What a contrast from the UK where many crags still have signs up saying “No climbing”, generally to ensure there is no comeback on the landowner in case of an accident. Where access is made difficult or sometimes barred in order to protect someone’s ideal of ownership, it is really a delight to be made to feel so welcome in your pursuit of what is really a fairly individual and esoteric sport. Kalymnos this year was just great, the weather was fantastic, 14 days of non stop sunshine with temperatures consistently in the mid to high twenties. Last year, mid November, it was a tad cold and windy which forced us to seek out crags that were south facing and had shelter from the northerly airflow. This year we were generally looking for shade from the sun, a result of which drove us onto completely different areas from last year. We spent two days on the crags at Telendos which are quite rightly a magnet for the mid grade climbers, one day at Ghost Kitchen, which although a magnificent crag was just a wee bit too hot. The rest of the days we spent on the line of crags above or around Masouri, which have shade for most of the morning and generally until mid afternoon. Some crags Symplegades for example are positioned in such a way as to offer shade at all times of the day. 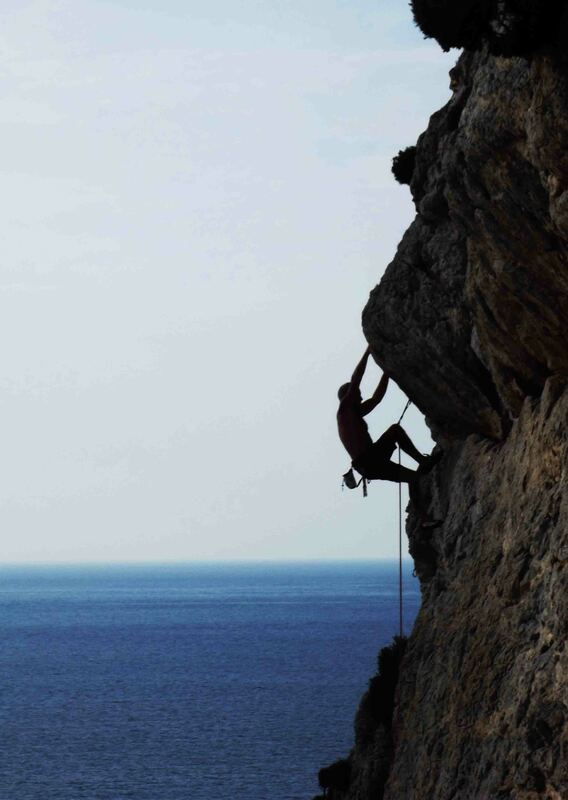 Kalymnos is a fantastic sport-climbing destination, which is undoubtedly why it is now so popular. This of course has its down sides, some of the crags were so busy that getting on the routes of your choice was just not possible. It also gave rise to some really awful behavior by groups who would put up a rope on the more popular lines and then hog these routes as all the members of their party gave it a go, real towel on the sunbed mentality. Its a lot steeper than it looks. For a rest day we went down to do some easy grade stuff at Kastelli, whilst most of the routes there are a bit polished the classic lines are just so over-climbed on top ropes to be almost undoable, certainly not enjoyable with the degree of polish, “shinier than a nuns knees” I can hear my mate Rab say. This will probably only get worse on the crags where lower grades predominate. However there is still so much to do there that this is only the tip of the iceberg and a small issue. This was our second visit, we have now spent four weeks there in total and we have still not been to half of the crags and sectors let alone climbed all the routes within our reach on the sectors we have visited. I really enjoyed this trip, when we were not climbing we swam in the beautifully clean and clear sea. The people there are just so friendly and helpful, we never walked back from a crag yet, someone always stopped and gave us a lift. It is still fairly inexpensive and the food and the accommodation are generally excellent. Canny wait, but its going to be for a month next time. Strictly speaking this was not the second session in the struggle to get fit, there have been a couple of mega sessions at the climbing wall and an afternoon bolt jumping at Cheddar Gorge but the camera had not been taken to either. So when Henry suggested a wee trip down to Pembroke to see his new first born and wet his head we were off. A quick drive along the M4 placed Jane and Choire and I on the slabs at Porth Claith in lovely early afternoon sunshine. The tide was dropping and we had access to the belay ledge to the bottom as soon as we arrived. A nice wee slab about 50ft in height gave us our sport for the afternoon and we ticked four routes there finishing on the cla ssic arete of Dreamboat Annie (E1 5A) It’s given E1 in some guides and HVS in others, but either will do. It’s not as poorly protected as advised, but it needs a steady head and a confident approach. After that we headed over to Haverfordwest where Henry and Corrine had set up for a weeks stay in a lovely little log cabin holiday home. The latest arrival (Gethin) seen we sat down to a mega Beef stew and rather a few bottles of Cider and Wine and before we knew it it was 01:30. The next morning was more than just a late start. Head hammering we wolfed some bacon and egg rolls and we were out again to St Davids for more “fun” on the slabs. Some of them are fairly steep to be called slabs and the gear is always a challenge, however today we were not going to be crunching anything particularly hard, our heads would not allow it, also it was a bit breezy and a wee bitty overcast and cold. Not to be put off we did a couple of warm up (clear the head) routes and then had a go at the classic route of the crag “Amorican” ~ 35m of absolute delight. It’s a VS 4C and is one of the top 50 routes in the Rockfax Pembroke guide and undoubtedly deserves this accolade. The top requires a confident approach as the last 8m or so has no gear at all and the finish is a wee bit chossy, but, if you are down there do not miss this route. It certainly cured my hangover. So that is the fingers wrecked for a couple of days, back to the wall now to hurt my shoulders and upper arms. Seven weeks of walking up and down mountains, hills and moors had done nothing for my upper body strength, true my legs are like coiled springs but that ain’t gonna help much in Kalymnos where we are headed in three weeks time. I had spent a day on the computer trying to reduce my admin backlog, enough was enough by 3 o’clock my brain was fried. Choire, Jane and I headed off to Fairy Cave Quarry to start the getting fit process. Fairy Cave is a bit crap really but its only 10mins from my house and the weather was a bit showery so it was the ideal choice (as opposed to the wall at St Werburgs) in case it all went a bit Pete Tong weather wise. There is only really one decent slab at Fairy Cave, the rest is all a bit loose and chossy, the routes there are a wee bit on the soft side for the grade but what better place to start exercising my arms of straw. Rob’s Crack is a three star VS. It’s a great warm up, it’s the best route in the quarry and despite its slightly greasy feel from the day’s showers it gave great sport. It was all over just a wee bit too soon so I opted for a bash at “smell the glove” graded E3 5C it’s probably only E2 5B but i’ll take the tick coz it was greasy and it clearly hadn’t been climbed in a while. The cracks and small ledges were full of grass and it was not easy trying to clean them out whilst smearing on greasy rock. Two good routes on my way to fitness, I do have a long way to go but then I have a lot of draws to put in for Gav. The idea was to find somewhere that avoided the heat, after weeks of rain, rain and more rain it was now hot, hot HOT. So shade was on the agenda, that and getting away from the omnipresent Olympics. So we went to clip some bolts instead of buying a pizza and several bottles of wine and sitting in front of the telly and getting fat. Choire, my lad, was also keen to get out and try to get his head back into the game after taking a big leader fall last year that and the fact that he has eventually seen fit to pack his crap job in so he has the time to come play. No excuses then, we drove over the bridge to Wales and sweated our way down to the big hole in the ground that is Tintern, not the most picturesque place in Wales but there was some shade. After being chased off of Sunnyside Wall by the sun we ended up on Jurassic Wall. There was a route there I had wanted to do for a while but it was always wet because this particular corner just doesn’t get the sun. A week of warm weather had worked a treat and the route was dry but a bit dirty from all the crap that had been washed down it by the weeks of rain. Anyway Raptor 6b+ but high in the grade is given 2 stars in the new Wye Valley book and for the first 20m really lives up to this reputation, shame then that the last 15m are run out, loose and chossy and just a bit crap. Should have had the lower off at 20m. However it was in the shade, Choire got his first lead in and I am back in time to watch the opening ceremony, hypocrite that I am. 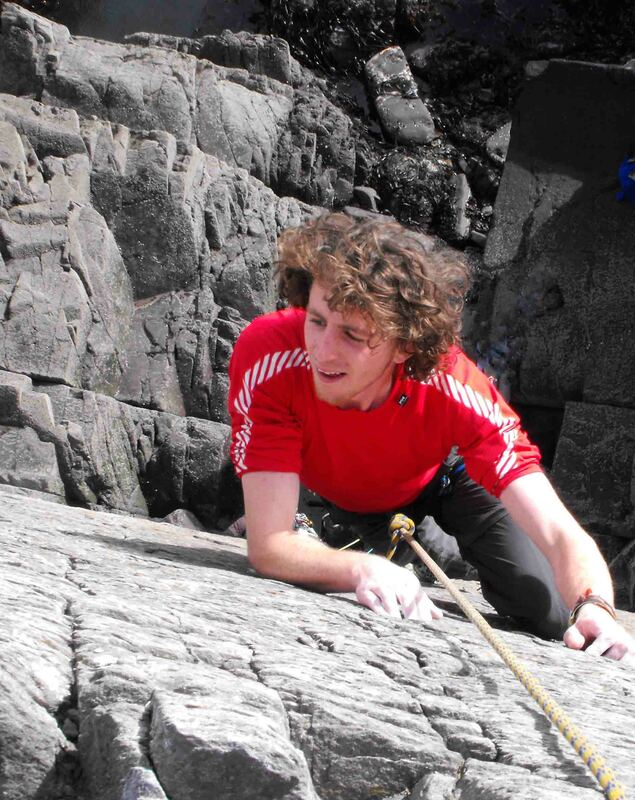 James on Brazen Buttress, Mother Careys Kitchen. Many things have conspired against my climbing this year. First the weather has been pants, second I have spend a lot of time out of the country in big mountains, third we have been extremely busy with UK based DofE expedition work. However the sun came out (in southern England anyway) the schools broke up (DofE has largely stopped now) and it’s 10 days till I go away again (to Pakistan). Given this somewhat unique set of circumstances Jane and I loaded up the car and set off on Sat morn to Pembroke. I should have factored in that it was the first day of the school holidays and the traffic was awful, however five hours later we pulled into the car-park at St Govans. 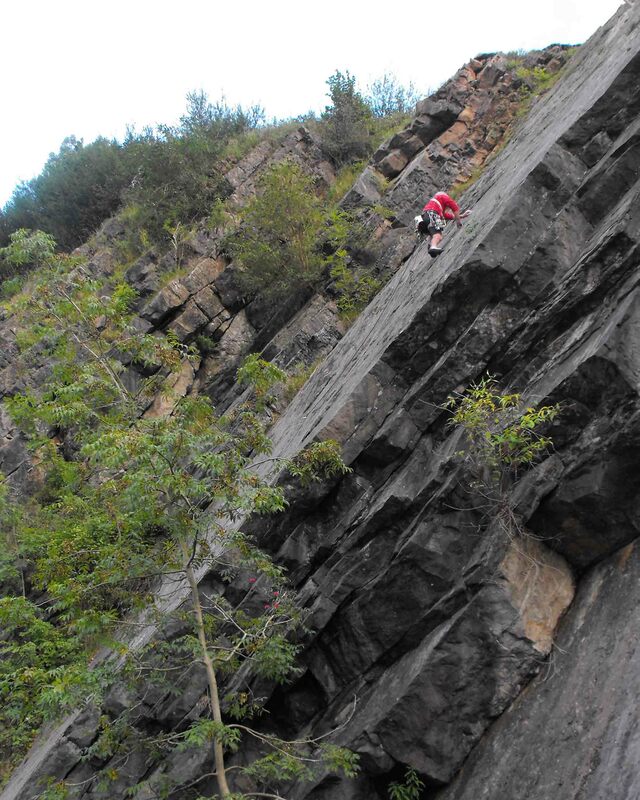 We set off for St Gov’s far east, abseiled in and got our fingers and heads warmed up on a three star HS called Ganymede, a nice wee route actually, then suitably psyched I launched myself at First Blood a three star Pat Littlejohn E2, which was thankfully by this time in the shade. Half way up, and on the crux it ejected me into space, aye well, it has been over 6 weeks since I tacked any rock, second attempt proved successful and after retrieving gear from the bottom of the crag etc we set off to camp up at St Petrox, (the CC Hut being currently closed for repair). 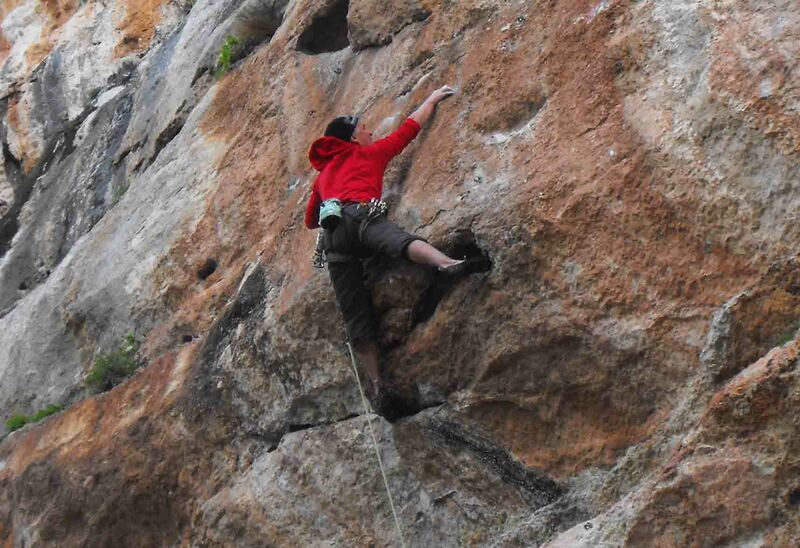 Pete fights the crux on the Butcher E3 5C. Next morning, after a leisurely start waiting for the tide, we were back at St Govs proper. No sooner had we sorted our gear than into the car park came Pete and James, Bristol climbers, they were headed for St Govs as well so we headed down together. One issue of climbing as a couple is that it is difficult (and very repetitive )to get good pics other than looking up at someones backside, or looking down on someones helmet. Jane and I tackled Clean Hand Blues, James and Pete the Arrow, then Pete got onto the Butcher and gave me the perfect opportunity to get some pics from my vantage point on the top of the crag. After that Jane and I got onto the Arrow and James and Pete went onto Deranged. By the time we had finished it was mid afternoon and lacking James and Pete’s enthusiasm for more we headed off for a walk along the coast. Next day as the range at St govs was firing and the crags there were closed we headed down to Mother Careys Kitchen along with half of Bristol. Mother Careys or Mother Scareys as it is affectionately known is half a BIG slab with lots of intimidation and half a massive overhanging wall called the space face with even more intimidation and lots of routes that are well beyond the reach of a mid grade climber like myself. The tide was high so Jane and I sat down to wait and watch. 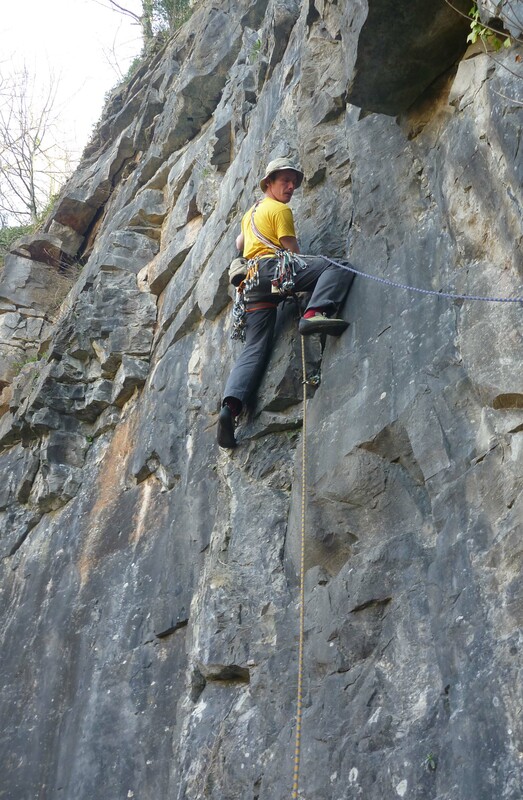 Pete and James abbed in to the the second pitch of Brazen Buttress and gave me a great opportunity to take some pics. By the time they had finished the route the sun was out, the tide had dropped a bit and the crag was covered in climbers. Jane and I abbed in and did a route called the cracks (a bit half heartedly) and then decided that the day was just too hot to continue with ropes and the rest of the paraphanelia so we packed up, took the gear back to the car and headed down to the beach at Shrinkle Haven. Not a frenetic three days of climbing, far from it but five good routes ticked and some wonderful R&R before I head of to Pakistan and the K2 Basecamp trek. Day in Cheddar Gorge, ticked Twillight of Imperialism, A Pat Littlejohn South West classic. Cooked in Chorro, 12th – 24th May 2012. The air shimmered, everything, including the mad dogs and Englishmen were hiding from the heat, even the cars which had been driven by their owners up bankings and into ditches to find shade under the trees looked as if they were seeking refuge from the sun. 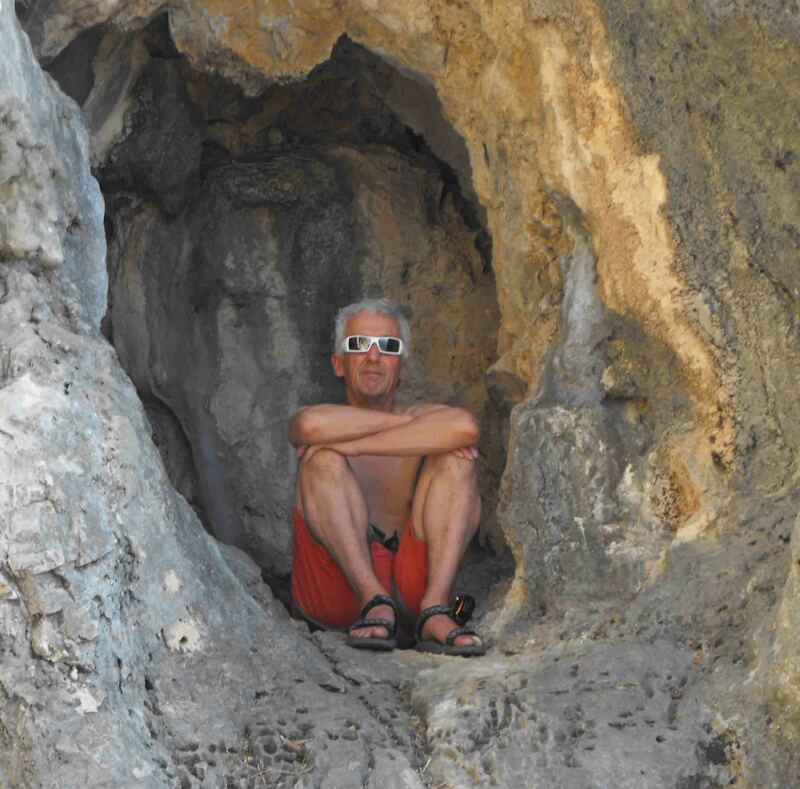 I had never been to El Chorro in May before, October, February and even March yes but only because the weather in the UK had been so awful did we decide to pack bags and look for some sunshine elsewhere did we end up there and then. El Chorro is a fantastic gorge and major geological feature (formed by the African and European tectonic plates colliding and forcing up an ancient (from the Miocene era) sea bed) which has resulted in acres of amazing limestone cliffs just inland from the Costa del Sol. However it is quite far south and as such does tend to get a wee bit hot but the climbing there is awesome, especially for a mid grade climber like myself. There are slabs, caves, tufas etc etc etc on rock of every conceivable aspect so that you are guaranteed to get protection from the wind and the rain and either shade or sun at any time of the day. The generally single pitch (but there are some monster multi pitch trad routes as well) climbing is reasonably well bolted, the lower offs are in good condition and the grades tend to be a little on the soft side which massages the ego. Sound Ideal? yes it is, which is what makes it one of my favourite destinations for a sport climbing trip. Couple that with lots and lots of crags to disperse the crowds, reasonably cheap and local accommodation (you do not even need a car) and finally its being really rural so that you need never be bothered with the crowds and associated crap that goes along with the Costa Blanca and Benidorm/Calpe rock trip. This little trip was no exception, despite having been there many times before the heat drove us to crags that we had avoided in the cooler and earlier trips and we had new routes and more than enough stuff to keep us interested. 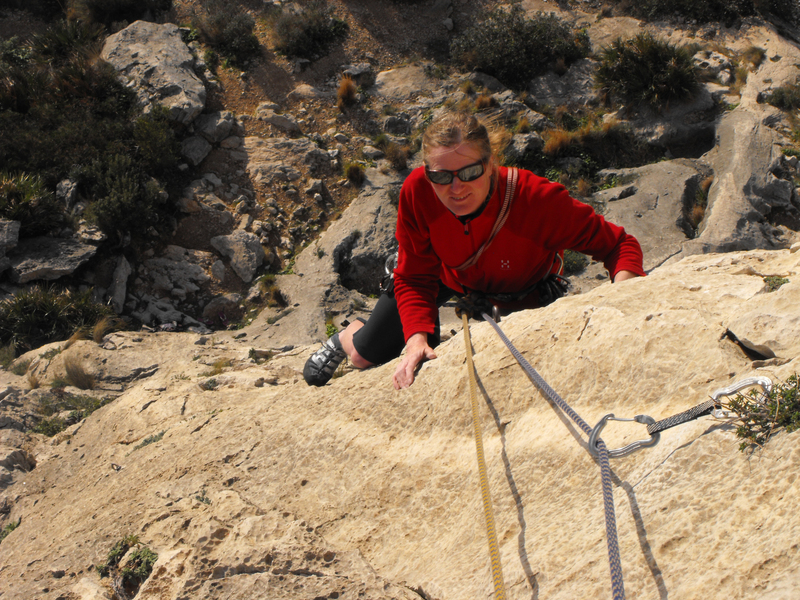 The other aspect of El Chorro are the associated activities you can indulge yourself in. Mountain Biking there is fab ( so I am told ) and there are some great walks to do on days when you need to rest your fingers and arms from the excesses of the steeper routes. 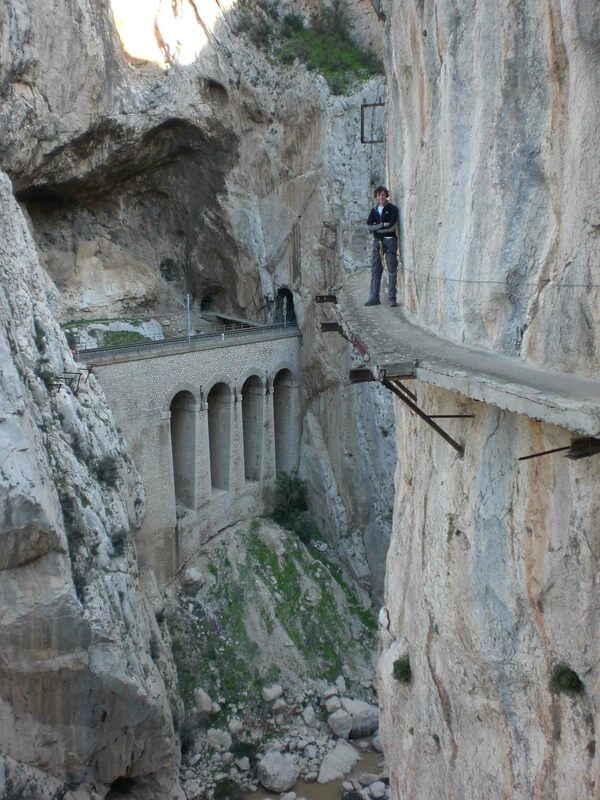 The other main feature of the area is the Camino del Rey ( Kings Walk ) which is a walkway built through and around the gorge which was used to give access to the major works ( Hydrological and Engineering) being undertaken at the turn of the last century. The then king of Spain used the feature to view the works and gave it its name. Since then the walkway ( 1m wide and approx 100m above the river ) had fallen into disrepair and the access to it has been taken away due to some unfortunate deaths. 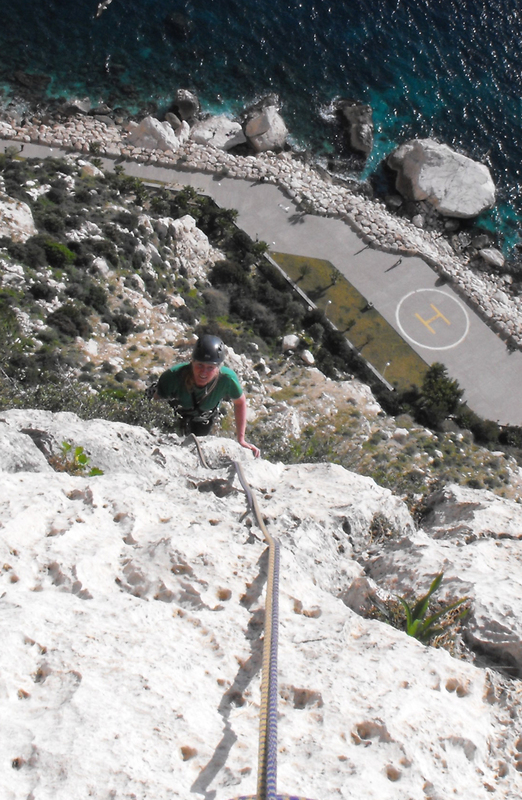 However if you have a head for heights, are capable with ropes and the associated safety measures of slings, screw gates and other paraphernalia of climbing you can still get onto the walkway and traverse the gorge. Its a memorable day out, its not totally safe, there are large sections missing, the concrete in places is rotten, the safety wire is dubious but its a great adventure and an outing not to be missed. It is possible if you have someone with a car to pick you up at the other end if you traverse the whole gorge, the other alternative is to come back via the train tunnels, which is against the law and if caught you will be heavily fined but its the way the majority of climbers get to the faraway crags in the gorge and again is a little bit of a forbidden fruit and further adventure, not that I am promoting it of course. Finally, as if that is not enough being there in May gave us another aspect of the area that we had not considered before. The recent rains had given rise to a fantastic display of local flowers and spring was in full flow. 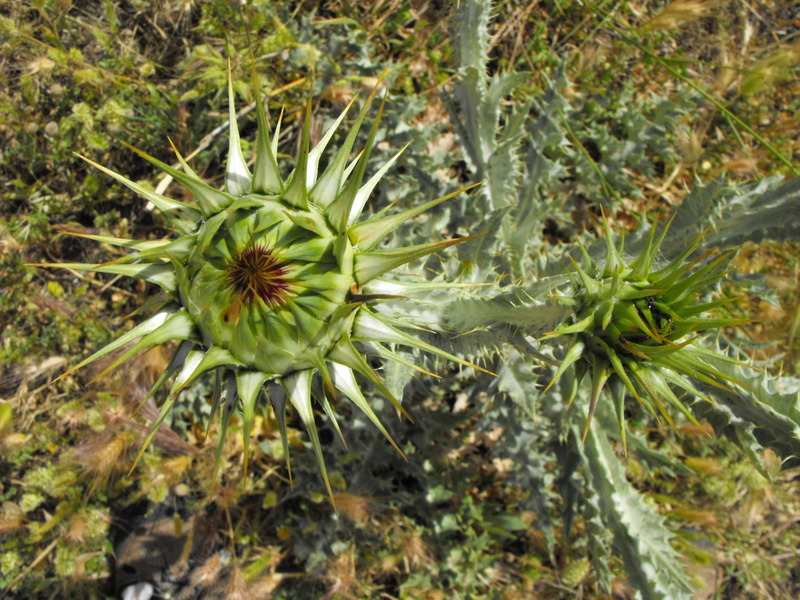 Going up to a crag at Desplomandia early one morning we walked up through a fantastic display or poppies, thistles and other wild flowers. A cuckoo was cuckooing away in the valley below, the fragrances of Rosemary and Tyme were strong in the nostrils and the only other sounds was the associated birdlife and the wind sighing in the grasses. Did I mention before just how much I love this place ! Portland 17th April, a flying visit. No..no pun intended. Jane and I were down doing a recce in Swanage for a forthcoming silver DofE so it seemed like the perfect opportunity to just “pop” over and check out some routes at Portland. Twas the first day after the Easter break and with everyone back at work we had the crags to ourselves. The sun shone, the wind was light, the temp cool so we headed down to Blacknor to see what we could get up to. One 6A, a 6A+, a 6B and a failed 6C later we retired with tired arms to the seaside to sit in the sun and reflect on why the 6B was easier than the 6A+ and how we were going to get stronger for the coming year. I hate to admit it but this week was the first of me getting back onto any real rock in the UK. It is one of the “problems” of enjoying so many disciplines in the outdoors. Winter climbing, walking, scrambling, leading on foreign mountaineering trips, sport climbing and the DofE work just soak up my time. 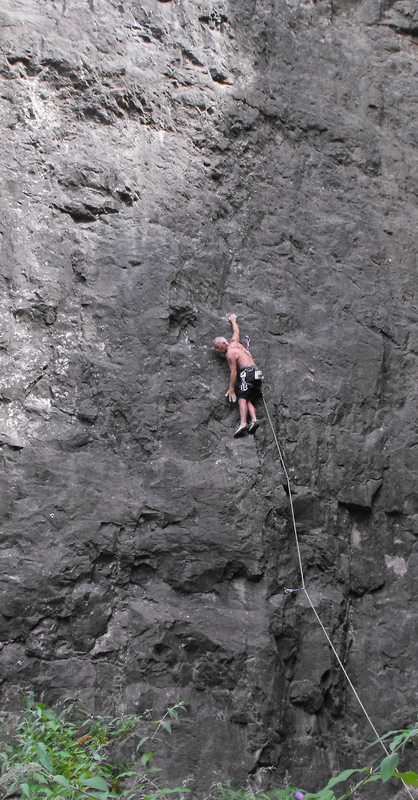 Then when I could squeeze a day I struggled to find a climbing partner, enough was enough. The weather this week was fabulous and I was “free” from Tues to Thurs inclusive. No excuses I dragged Jane down to Goblin Combe on Tues to get my rock legs back. 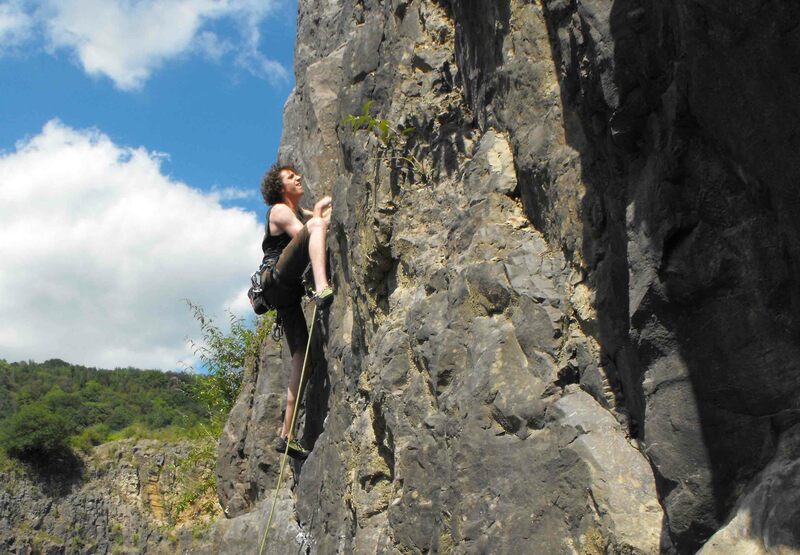 The day was fabulous, the sun shone, the woodpeckers pecked in the background and I warmed up on Gunabad, a classic E1 then got onto Smaug and launched myself over the E2 crux ( taking a bit of a flyer on the first attempt) to find the big jug and salvation. 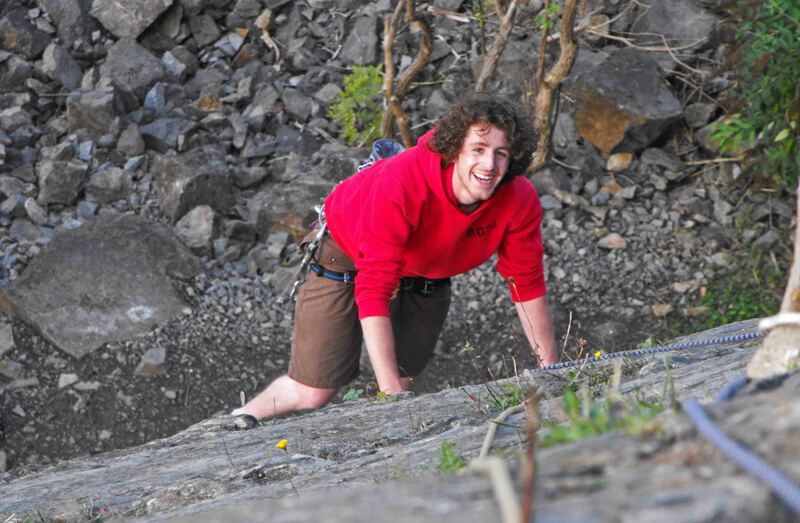 Not to be tempted by his antics I led off on Big fly direct a nice three pitch E1, low in the grade but a nice warm up. Henry then decided we should seek shade in the back of the quarry, it was hot and seemed like a good idea. He found something called Industrial disease, a charming name for an HVS which in fairness wasn’t that bad. He then pushed me towards a route called Men without Hats, Phil Beddow put this up, why, I must ask him. Choss city would be a better name, after calling fer ma mammy on several occasions and trying to ensure that the rock I pulled off didn’t cream my belayer I topped out and swore at Noggin for route choice. To round off the day Noggin then decided to have a pop at an E2 called Touchez mon Derrier. Flippin heck can he choose a pile of choss, he has an uncanny knack for it. So that was it, my first outing in the UK this year, a day at Goblin and a few piles of choss at Wintours. Well Big Fly direct wasn’t all bad. Next venue is definitely my choice. 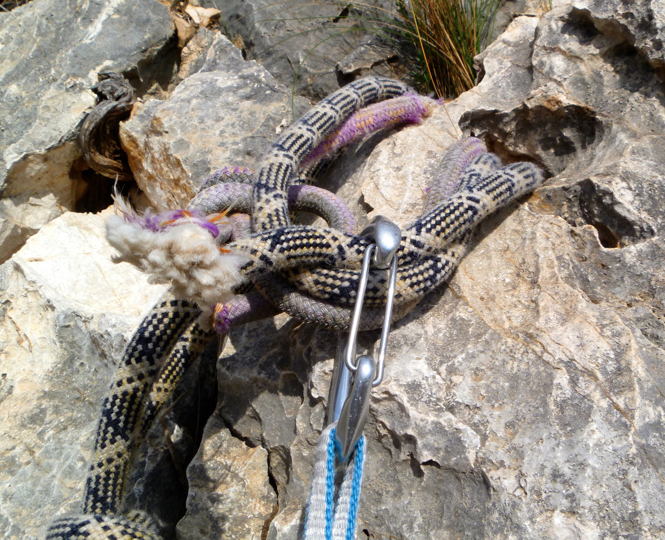 The Costa Blanca was where I started sport climbing over 20 years ago. Aye I can remember when it was all fields there !! But seriously we had a 100 page guide book by Chris Craggs ( who my wife once told that his name would be better if it was Cliff ( He wasn’t particularly amused)) which detailed some couple of hundred routes, this then evolved into a Rockfax guide as the popularity of the area exploded and the routes became increasingly polished. 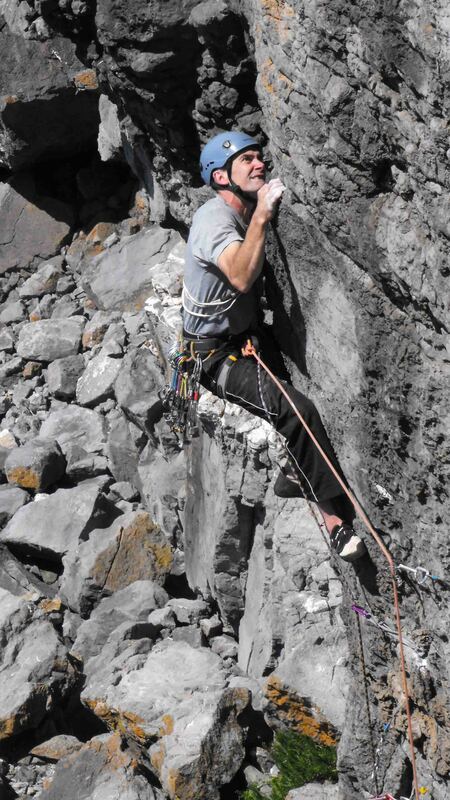 There are however a couple of really good venues for some more adventurous climbing in the Blanca that give a change from the clippity clipping of single pitch sport routes. So it was with this in mind that we packed the twin 50’s, a small rack, helmets and the other paraphernalia of long multi pitch days out into our bag and joined the usual jostling of the easyjet queue bound for Alicante at Bristol airport. We arrived late morning picked up the cut price Jalopy and drove out along the autopiste of death toward Calpe. Stopping only to pick up some victuals we dumped our bags, packed the rucksacks and headed out to Toix to get some afternoon sun and the feel for some hot limestone. If the Costa Blanca was where I first experienced sport climbing, Toix West was the first crag I ever waved an extender at. It is a bit of a low grade area which should be ideally suited to beginners. 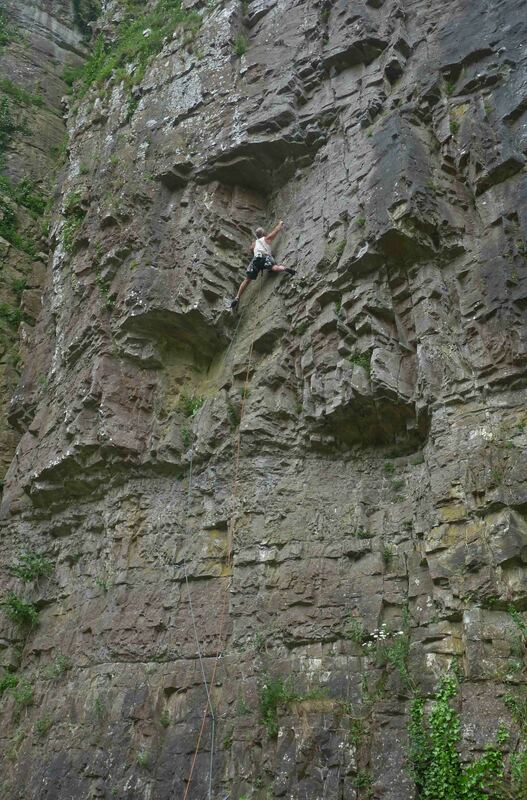 However there has been activity with the drills there and quite a few more routes have been squeezed onto the crag. It has not improved the venue, there are now so many routes there that it is rather difficult to determine which line is which. Also the gear which we climbed on 20 years ago has not been renewed and some of it it simply laughable. Rusted Bolts, really dodgy lower offs, pegs that I wouldn’t hang my rucksack on. Thankfully we had the venue to ourselves ( I would hate to be climbing there if it was busy as so many of the routes use the same lower offs which are on stone littered ledges ) so we picked a couple of low grade 6’s with newer bolts and warmed up till the sun went down. The Penon De Ifach is a large lump of limestone that marks the end of a major Spanish geological feature. 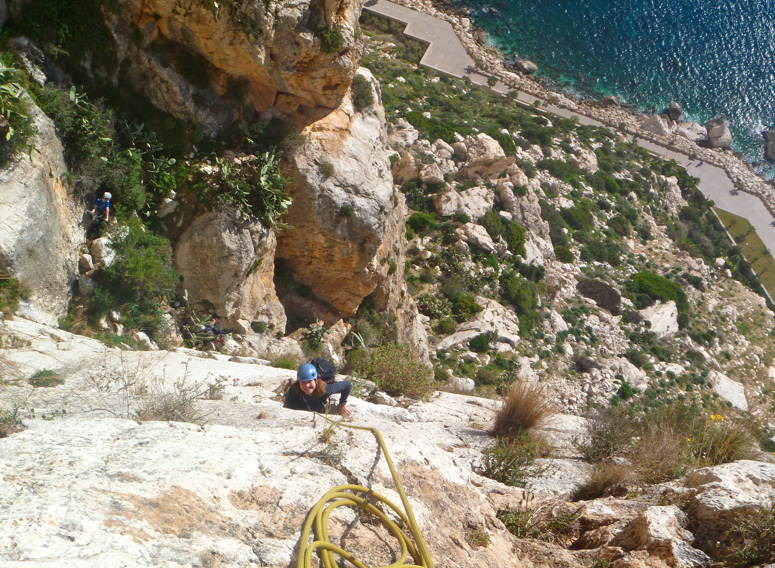 It rises for some 1300ft out of the Med and offers some good and adventurous ( partially equipped ) Multi pitch lines. I have climbed many of the more ( and less ) popular routes here in the past so chose a route called Via SAME which is given E3 by Chris Craggs and 5, 6B, 4, 6A, 5+ with three pitches of concluding easier climbing above to reach the summit. The first three pitches went off well enough and seemed to be about right for the grade, these bring you to the open crack pitch graded French 6A by rockfax and British 6A by Mr Craggs 20 years ago. Bit of a difference here and in truth is probably somewhere between the two, lets settle on strenuous British 5C or F6B protected by dodgy threads ( likely the same from 20 years ago ) and some dubious bolts. This takes you into an enclosed chimney stance which once your partner has joined you ( Which in the case of Jane with much sweating, swearing ( at me for route choice) and leaving quite a bit of skin and blood on the rock on the way up ) you climb up and then squeeze out of a fissure at the top of a bulge into a position of incredible exposure and the warm sunshine. The fissure is so tight and awkward that Jane could not get through it wearing the rucksack and had to tie it onto one of the twin ropes for me to pull through, then after leaving more skin and blood on the way through joined me on the belay of the gods. It was a really scary experience, squeezing through the fissure was really awkward and the move so tenuous that falling off was a very real possibility, if that had been the result then the final resting place would have been on the end of the rope hanging in space some 3 or 4 m from the fissure. 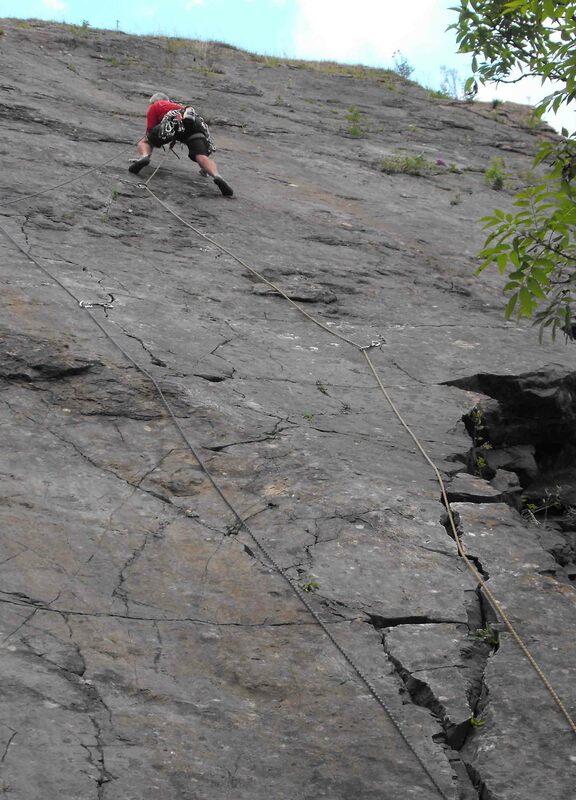 The belay position was awesome but the 700m or so of emptiness beneath our feet ate away at your mind. However fear is an emotion with the shortest half life of all and by the time we were on the slab i was buzzing with elation and looking for more. BRILLIANT..E2 seemed about right for an overall grade after we had made our way up the slab, along the ridge and disposed of the three pitches of “easier” climbing to reach the summit above. Kim et al had meantime been working their way up a route to our left called Via Valencianos. I have done this route many times before and found it a tad polished. Kim’s view was ” A hellish route, polished like glass, overcrowded, badly protected not in the least enjoyable. We all finished on the top more or less simultaneously and made our way down for some really deserved cold beer. The next day was spent recuperating, paddling in the sea and just generally chilling out, Via SAME had given us both a bit of a kicking, physically and mentally and hey, the sun was shining, it was high 60’s and life’s too short to ignore the beach. The rest of the week flew away with visits to Echo valley ( where I ended up having an adventure on a 50m ( which turned out to be 55m ) 5+ ( which turned out to be 6B ) on 50m ropes which needed 16 draws and I only had 14. The Toix Amphitheatre ( Magic sport route called Rainbow Wall ), The Puig Campana and more paddling/sitting in the sun. Kim et al had an adventure on magical mystery tour and Epsolon Central on the Puig. So how ( In my humble opinion ) is the Costa Blanca now, in a word dangerous unless taken with the appropriate degree of respect. The gear that was there 20 years ago, especially at Toix is in a laughable condition, rusted single bolt lower offs are not uncommon, Lower offs that do not close or that are almost worn through with continual top roping. Tat, pegs and bolts that should have been replaced long ago or that has been backed up again and again. Clearly the drive here has been to open more and more venues to keep the punters coming but with no policy on replacement of existing gear at existing venues. I would think carefully about choosing this as a venue to start your sport climbing career as there are likely going to be injuries caused by equipment failure in the near future. Maybe this is one of the failures of sport climbing and consumerism, develop, consume/climb and move on to the next venue leaving polish and rock litter in evidence. Who’s responsibility is it to keep this equipment in good condition anyway. I do not have the answer but do not think I would recommend this venue for novices/lower grade climbers who are looking for a well equiped venue. great time in spain, already thinking about next year!! can’t wait for the new guide book, which will undoubtedly be already out of date!! 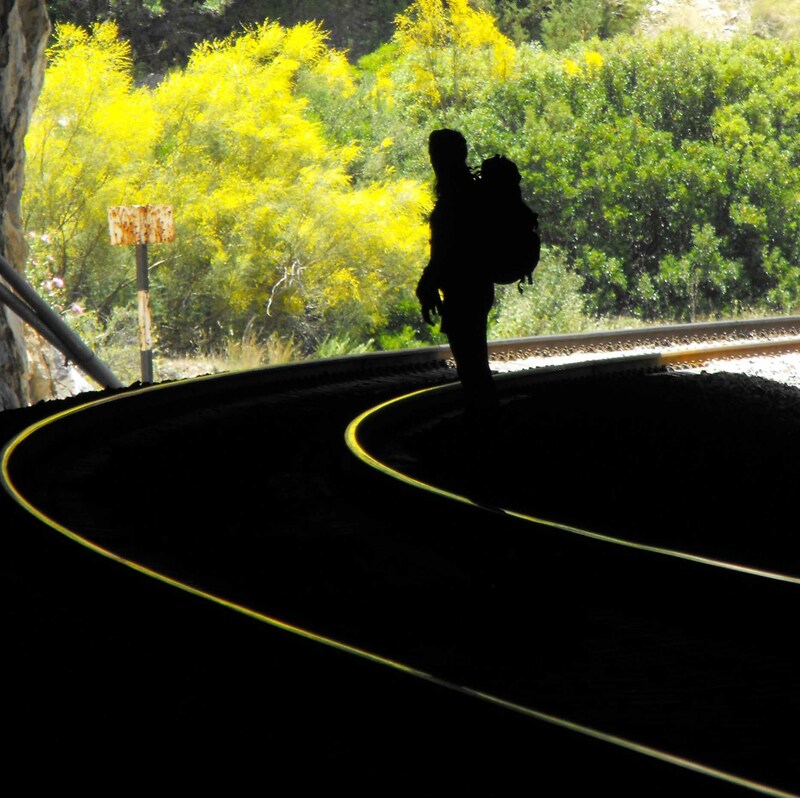 Pingback: Caminito Del Ray – Extreme hiking | Footprints Forever : Travel, Photography, Tips and more ..